Which schools can register with Teacherhorizons? Why should I register my school? How can I register my school? How can I personalise my school’s page? Why do I need to include salary information on my school’s page? What happens if a teacher breaks contract? Can I advertise my jobs on the Teacherhorizons website? How can Teacherhorizons guarantee the quality of candidates? How can I contact Teacherhorizons? We aim to visit the schools we work with to get to know the leadership team and find out what kind of teachers they are looking for. If this is not possible, we always have a Skype meeting with the school to find out about them and ensure they are suitable places for our teachers to work. Screened teachers – over 50,000 teachers visit our website every month looking for vacancies at top international schools, and this figure is growing quickly. We have over 200,000 registered teachers who have been screened by our team of experienced educators. 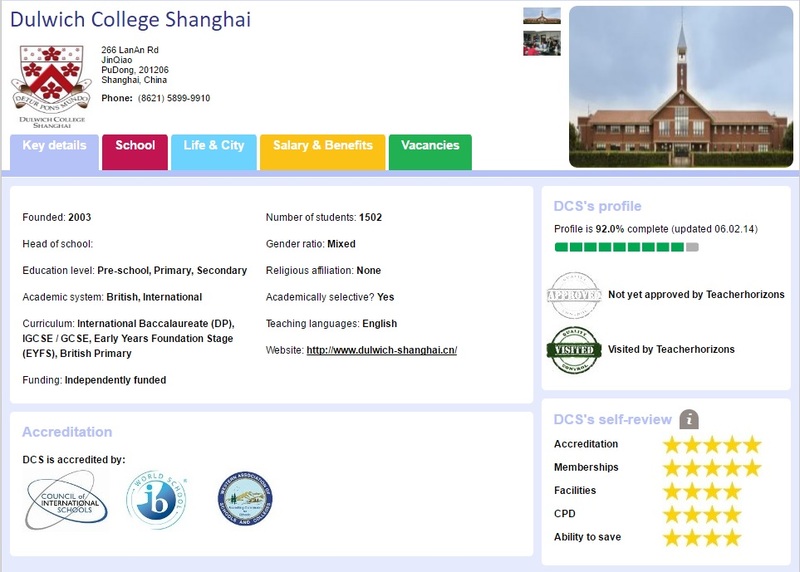 Top international schools – Over 2,200 schools in 150 countries have already signed up and created a free profile page. This enables them to promote their school, post vacancies and fully access our candidate database. Personalised recruitment – Hundreds of schools also use Teacherhorizons Global as a recruitment agency. There is no up-front cost to this – we promote your vacancies via our networks and social media channels, send targeted emails, screen and interview candidates on your behalf. We send the strongest candidates to you (tailored to your preferences) and you only pay if you hire one you are happy with. Fill in our quick form to request your free profile page or email info@teacherhorizons.com with your school name, country, city and website. Once we verify your school is genuinely an international school, we will create a profile and email you with your username and password. This does not commit you to any membership or service charges. Having a completed profile will significantly increase your chances of attracting suitable teachers. Once we have sent you your login details and your have added the school’s key details, you can add photos of your school and a description that will encourage teachers to work there. You also have the option to add a video. You can give your school a star-rating on a number of criteria such as accreditation, facilities, and ability to save. See the example of a completed profile page below. Why should I include salary information on my school’s page? We encourage you to include salary and benefits information because we believe in providing transparent information to candidates. You can display your salary as a range to allow some room for negotiation. Your salary information is not publicly accessible – only ‘activated’ teachers can view it. In our experience, it helps attracts serious and suitable candidate who will be more likely to accept a position. What happens if a teacher breaks contract? What will Teacherhorizons do? Registered teachers agree to the Teacherhorizons Terms & Conditions, which stipulates that the teacher is responsible for paying part of the replacement costs. We will find you a suitable alternative or offer a credit note which can be used against your next placement made through Teacherhorizons. Consult our Terms & Conditions for schools for details regarding refunds and replacements. A registered school with a profile completed to over 80% may advertise an unlimited number of vacancies on their school’s profile page. To find out more about this service, including our fees, email us. First, we identify whether they are qualified teachers that match our schools’ high requirements. Our team of experts then review their CVs and profile. If candidates pass this stage, they are interviewed by skype to check their experience and teaching background. We then review their references – one reference must be from their current school head or deputy head. Our recruiters have all completed courses in safer recruitment and child protection. Only if a candidate passes these steps will they becomes an ‘endorsed’ teacher, will we recommend them to schools we work with. Your school’s Lead Recruitment Adviser will always double-check a potential candidate before sending you their profile and CV. So when we recommend a candidate, we are confident that they are suitable and match your requirements. For our Explorer service, candidates will have had a basic screening but we advise all schools to complete their own thorough screening process, including following up with references, before offering employment. Request your school’s free profile page here or email us for more information. We are still developing this service and are offering selected school the opportunity to be part of trialling this service. Explorer empowers schools to search and filter candidates directly from our database. They can use it to access candidate profiles, CVs, supporting documents and confidential references. They can also contact them directly. Our hire fee for Explorer is only £795. You can read our Explorer FAQs here or get a flavour of our live candidates here. The 4 most common questions about teaching in the UAE, answered! Ask The Expert: Meet Jo!